Butterfly bush or buddleja davidii is a large shrub with an open growth habit that carries large panicles of heavily scented flowers. They look great as a stand-alone shrub, but it is also possible to grow a hedge out of them. 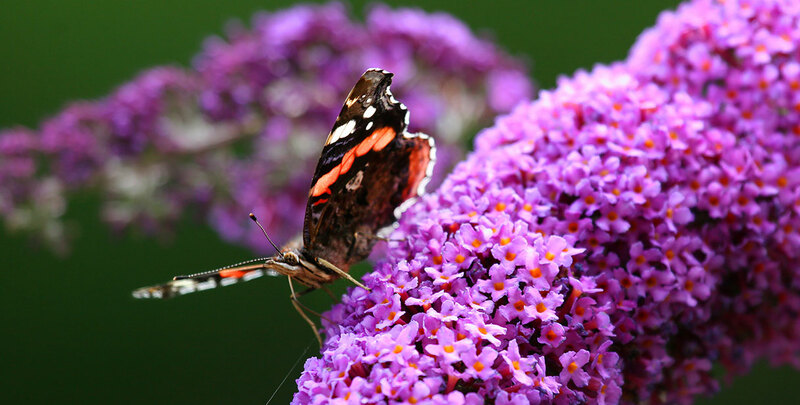 Butterfly bushes make ornamental hedges that are easily pruned and maintained, which makes them outstanding specimens for inexperienced gardens with a fondness for flowers, as it does not take a lot of experience to decorate your garden with a colourful, vibrant buddleja hedge. If a colourful hedge is what you are after, you could simply choose to create a butterfly bush hedge with the flower colour that appeals to you most. But it is also possible to create a mixed butterfly bush hedge in order to provide your garden with an almost kaleidoscopic burst of colour. Although hailing from China, butterfly bushes will happily grow in our climate. Only truly harsh winters with 15 to 20 degrees of frost can be detrimental to the health of this plant and though such cold winter months are fairly uncommon in the UK, it is possible to protect a butterfly bush against frost damage should such temperatures occur. This species flowers from July to October and gets its name from its ability to lure butterflies into your garden with its nectar, which is apparently very appealing to butterflies and other pollinating insects. In addition, a wide variety of cultivars has been developed with stunning colours and shades, ranging from white to lilac or blue. Most colours are a shade of lilac, which is why this deciduous shrub is alternatively known as summer lilac. The butterfly bush is native to the Hubei and Sichuan provinces in central China. Some botanists, however, have claimed that its origins can be traced back to Japan. Regardless, after this beautiful flowering plant from the Far East was introduced to the temperate regions of Europe, it quickly felt at home in our part of the world. In fact, the butterfly bush grew sufficiently accustomed to our temperate climate to even be classified as an invasive species in the UK these days. If it is maintained properly, however, it is relatively easy to keep it from growing out of control. In fact, butterfly bushes encourage you to do so themselves, as they will stop flowering if they have not been rigorously pruned in a while. When the species was discovered by botanists and garden enthusiasts in the west, the butterfly bush was quickly valued for its immense ornamental value and several nurseries started establishing their own cultivars, especially focused on creating varieties with different growth habits and the most beautiful flower colours. 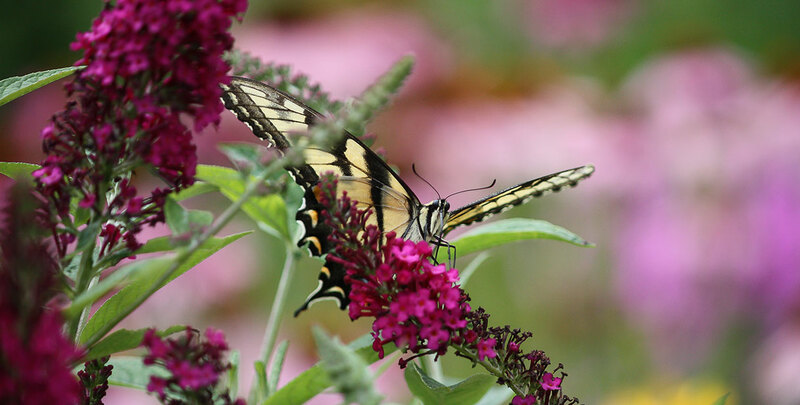 Butterfly bushes are not just popular for the appearance of their flowers, however. Their relatively late flowering season adds a little colour to any garden during a time when most other hedging plants have already shed their leaves and flowers. Summers simply last longer in gardens with butterfly bush hedges. 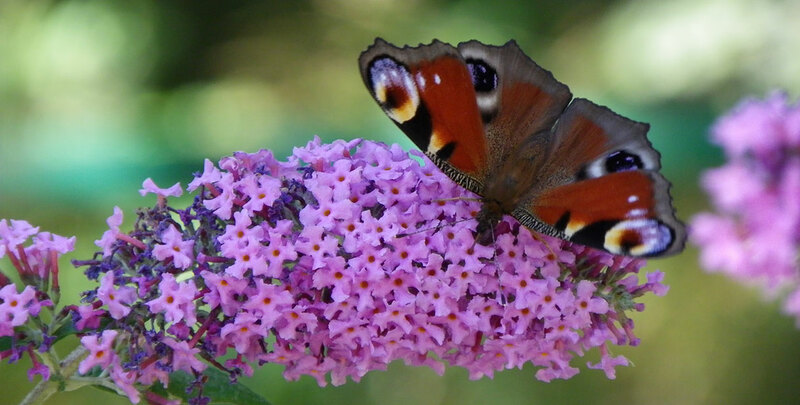 Butterflies will certainly appreciate it when you plant a buddleja hedge in your garden and they are not picky when it comes to the cultivars chosen, as all varieties are alike to butterflies. 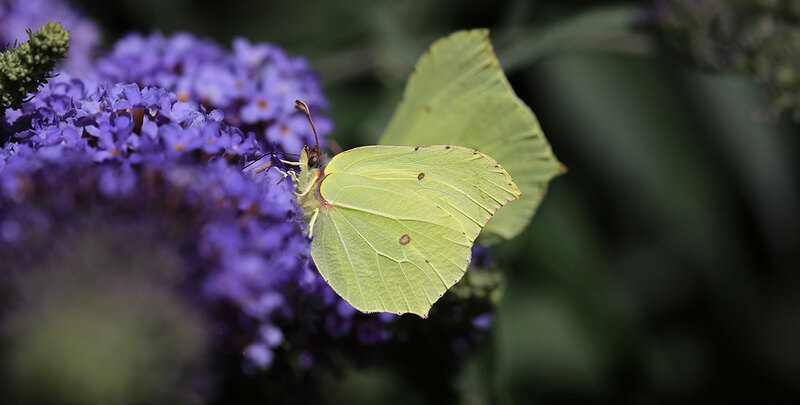 While maintaining a mixed buddleja hedge requires a certain amount of precision, butterfly bushes make undemanding hedges that will thrive in almost any well-drained soil. This includes heavy and alkaline (chalky) soils. As is the case with most hedging plants, a position in the full sun is beneficial to flowering, although a butterfly bush is able to deal with partial shade. As for combining varieties, you can simply let your imagination run wild. Our suggestion would be to interplant the bluish lilac ‘Empire Blue’ with the ‘Pink Delight’, the reddish purple ‘Royal Red’ and the ‘White Profusion’, the only white butterfly bush variety, as this combination will be very appealing, as well as cost efficient. However, the result of this combination is hardly the only option to create a beautiful mixed buddleja hedge. As new flower racemes grow from young wood, we recommend you prune your mixed butterfly bush hedge rigorously during the early spring. By removing all of the growth from the previous year around March, you will create the perfect conditions for an abundance of beautiful flowers to appear during the summer. An additional benefit of such rigorous trimming is that it will keep your buddleja hedge from growing out of control. You can even extend the flowering season by deadheading the flowers after they have dried out. This will also keep the plant from seeding. Remember that fertilising your mixed buddleja hedge should be avoided. While this is beneficial to its leaves, which turn yellow before being shed, it will not improve flowering. There are so many beautifully coloured butterfly bush cultivars available that we can imagine people experiencing some difficulty picking the perfect colour for their gardens. Luckily, you do not have to settle for just one colour, as the butterfly bush offers the opportunity to create a beautiful mixed hedge. By combining buddleja varieties with flowers of different colours, your garden will simply look stunning throughout its relatively late flowering season, which will make your hedge stand out when the appearance of many other hedging plants has already become dull and monotonous. In fact, a garden with a mixed buddleja hedge will be even more vibrant when the pleasant fragrance of its flowers attracts butterflies. As it is the smell and not the colours that draws these beneficial insects, you can simply focus on finding the most beautiful combination of colours for your garden.